One of my favorite things to do with my girlfriends, is to drag them to obscure, random, foreign places and introduce them to flavors and textures that they have never met before. 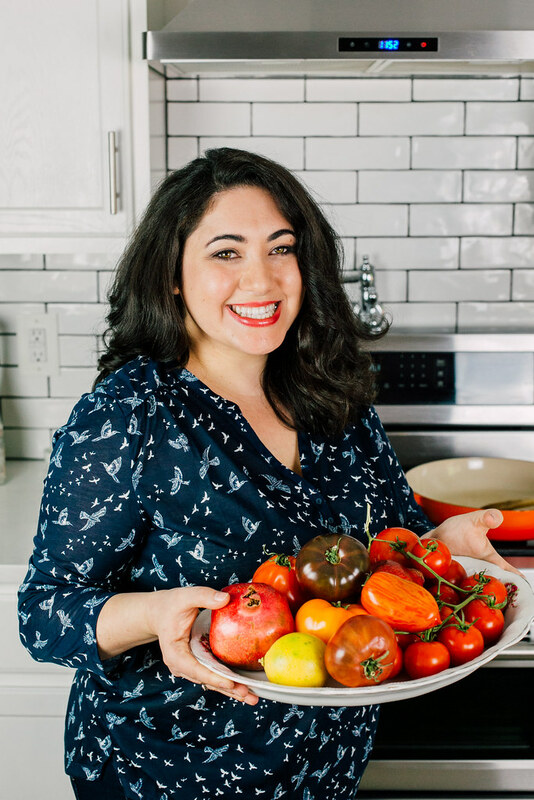 Some of the time, they nod their heads, hold their nose and take one for the team, but most of the time, they oblige happily and are surprised and interested in the new flavors and cultures they are experiencing. One of the last places we visited before I moved, was this Persian restaurant in a, let’s just say “up and coming” Middle Eastern area. The area wasn’t that great. We made sure to lock the car doors and walk in a group and the restaurant entrance was behind the main street in the alley way. I could totally feel the tenseness but happily obliged when I saw groups of Middle Eastern families enjoying dinner and sipping tea. I knew dinner was gonna be awesome…always go where the locals are! Girls dinner date tonight! Kabob platter, borek, muhammara…I’m in heaven! Everything from kofte to falafel, muhammara and of course hummus was presented family style. 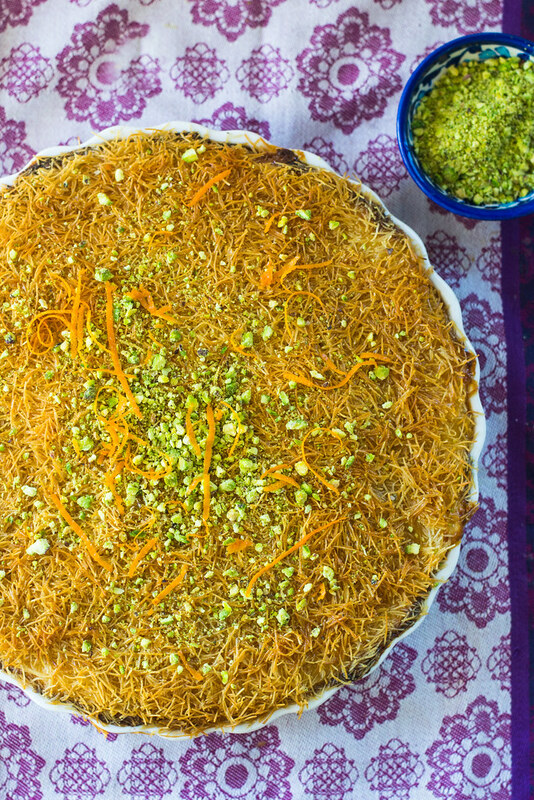 We ate, laughed and gossiped but one of the lasting bites was kanafe~ I haven’t had this since I was little and I almost forgot it existed! 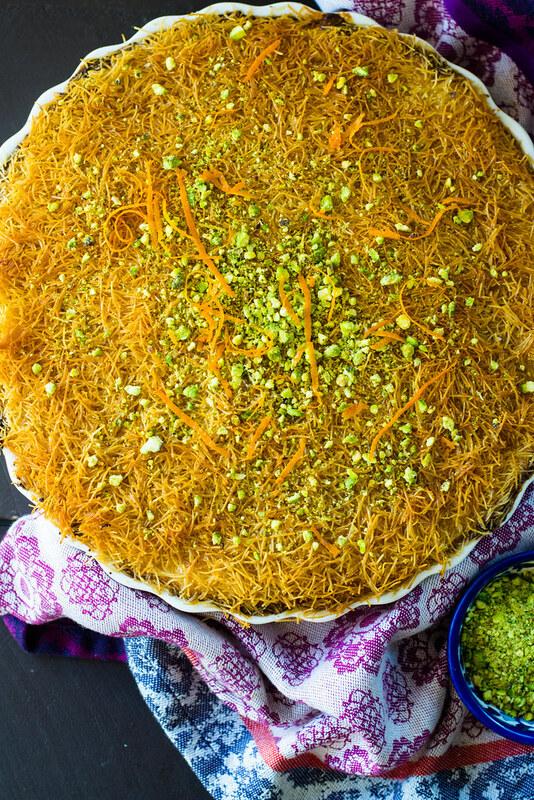 A close cousin to baklava, kanafe is a dessert made with shredded phyllo dough, which you can buy at Middle Eastern/Internal stores called “kataif”. 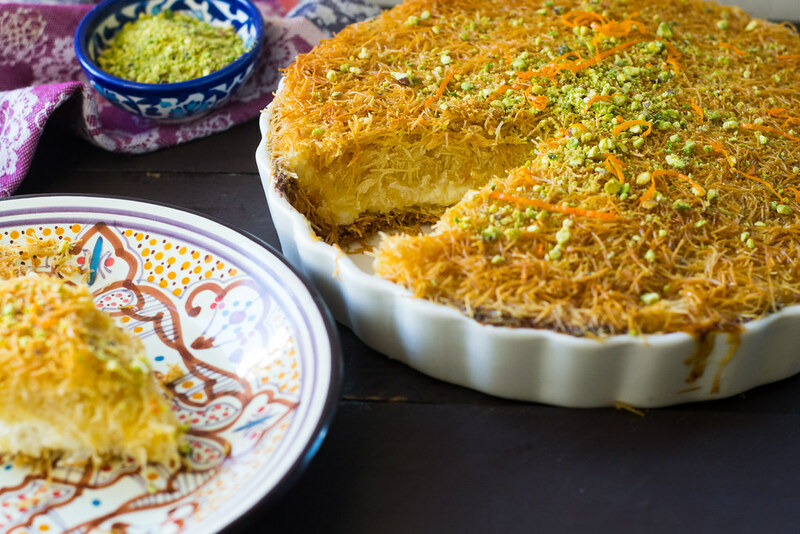 It is then layered with cheese (I used strained ricotta and mozzarella), topped with more shredded phyllo and then soaked in a gorgeous aromatic simple syrup. The sweet and slightly savoriness of the cheese is a perfect combination and is fabulous with a cup of tea! Then, make the simple syrup. In a small pot, add all the simple syrup ingredients and stir together. ring to a gentle boil and allow to cool for about 10 minutes until sugar dissolves and gets a bit thicker like a syrup. Take off heat, remove the aromatics and allow to cool while making the rest of dish. Take the shredded phyllo and pulse in food processor a bit (may have to do this in batches) so the phyllo breaks up a bit. Pour in about half of the melted butter (and optional saffron water) and continue with the rest f the shredded phyllo so butter coats all of the phylllo. Then, take half of phyllo and press into a large buttered dish (I used my tart pan). Add shredded mozzarella and drained ricotta and top with the other half of phyllo, carefully pressing it everything together. Bake at 350 for about 40 minutes until top is golden brown and firm. 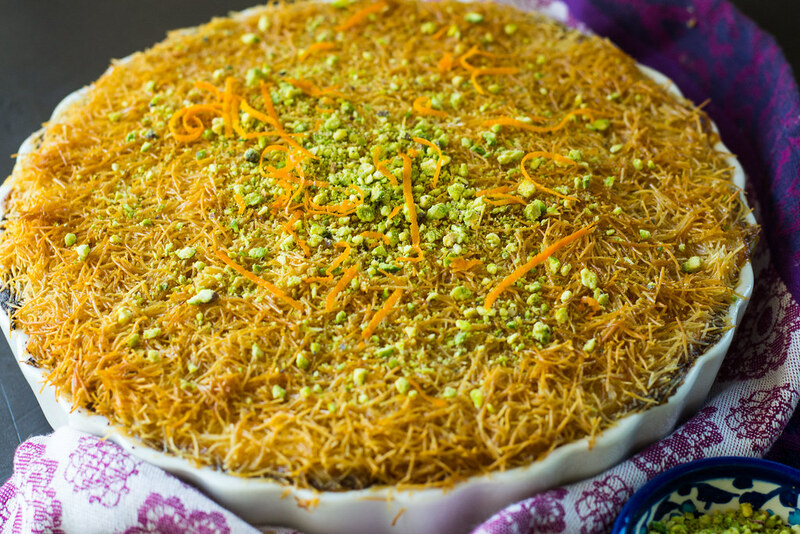 Once kanafe is done, remove from oven and slowly pour syrup over the top. Allow to sit for at last 10 minutes so syrup can soak in. YESSSSS. I love love LOVE kanafe, ever since studying abroad in Jordan. (It may actually border on an obsession.) Can’t wait to try making at home!